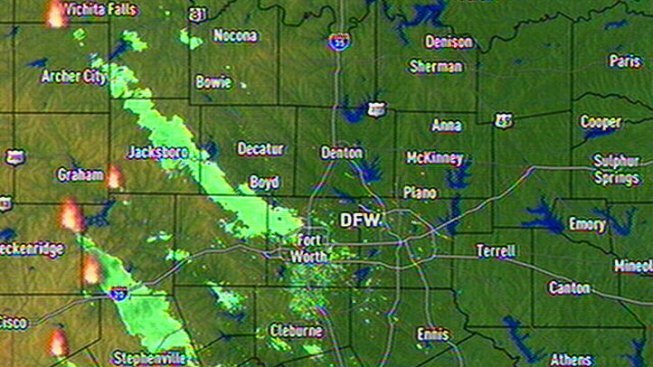 Radar shows the smoke drifting over North Texas from fires in Wichita Falls as well as Possum Kingdom Lake. A large plume of smoke is making it's way into North Texas, but from farther away than you might think. The haze currently hovering over parts of Parker and Tarrant counties is from a wildfire in Wichita Falls, more than 100 miles away, not the closer fire in Palo Pinto near Possum Kingdom Lake. With wind gusts to the southeast reaching 50 mph, the fires in Palo Pinto County are pushing into Hood, Erath and Somervell counties, as well as the southwest corner of Parker, but not Tarrant. The smoke plumes are so large, they can be tracked on radar, as they are in the image above. The wildfires in Wichita Falls have prompted evacuations as the wildfires spread into the city, according to the TimesRecordNews.com. Neighborhoods adjacent to Sheppard Air Base are in immediate danger and all Wichita Falls firefighters have ordered to duty near Interstate 44 and Missle Road. At Possom Kingdom, 20,000 acres were said to be on fire as widlfires raged out of control. More than 200 homes were evacuated while others were consumed by fire. Read more on that fire here.